The world possesses some two thousand species of catfish, of which two dozen can be found in the United States and about a dozen are native to the South. 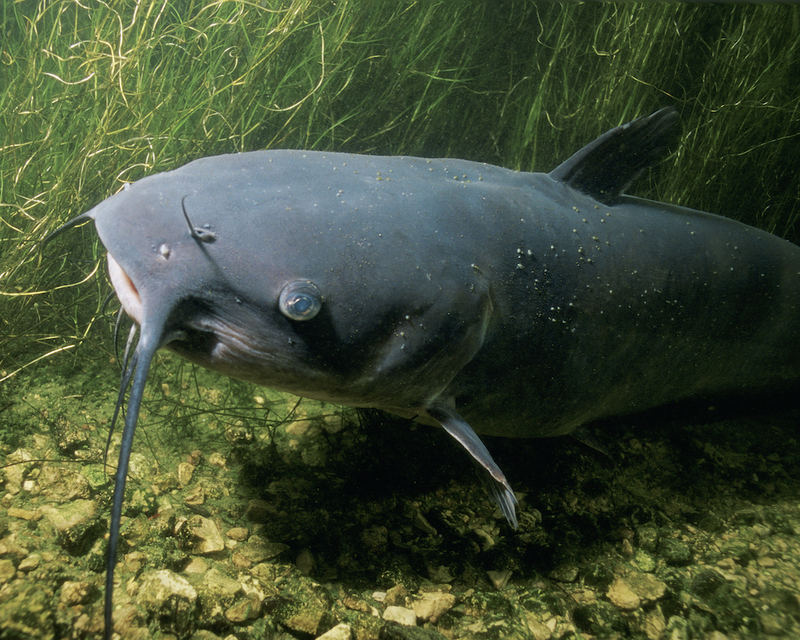 They can be roughly divided into three types: flathead, channel, and blue catfish. Flatheads and blues weighing upward of 150 pounds have been hauled out of southern waters. People in the South have been eating catfish since time immemorial. They are found in every fishable body of water—farm ponds, streams, lakes, and rivers of all sizes, including the Mississippi. Catfish are omnivores in the true sense. They will eat practically anything, making them easy to catch with even a chicken liver or a ball of dough. They grow to eighteen inches in a year and if left alone will stay down near the bottom, living to old age and growing to huge size. In the South, Native Americans were first to exploit the fish, followed by Americans of African and European descent, who tended to cook catfish in one way—bread it in cornmeal and fry it in hot grease in an iron skillet. Because of its omnivorous eating habits and preference for feeding close to the bottom, wild catfish has a strong flavor regardless of how it is prepared. The time-honored method of skinning a catfish is to nail it to a board or a tree by its head, make a slit around the gills with a knife, break off the dorsal and pectoral fins with pliers, then use the pliers to grasp a loose flap of skin from the incision and peel it down toward the tail like a tight piece of clothing. Extreme care needs to be exercised when handling catfish. The spines at the tip of a catfish’s dorsal and pectoral fins have a venom gland whose secretions can put a human being in severe pain lasting between twenty minutes and a couple of days; hospitalization may be necessary if a fin breaks off in a hand. The catfish has proven adaptable to aquaculture, and it is the largest-selling farm-raised fish in the United States. Catfish can be easily trained to come to the surface for food, and if they are fed a grain-based aquaculture diet, their flesh has a neutral flavor that takes on the taste of whatever spices are used in its preparation. The lion’s share of the North American fish-buying public does not want the fish it consumes to have a strong flavor, and the blandness of farm-raised catfish has been a marketing plus. Catfish has been a significant form of farming in Mississippi, especially in the Delta, since the late 1960s. Belzoni, the seat of Humphreys County, has sponsored an annual festival since 1976 to celebrate its status as the Catfish Capital of the World. In the late 1980s farmers began catfish production in East Mississippi’s Black Prairie—mainly in Noxubee, Lowndes, and Kemper Counties, but catfish production has declined significantly in the twenty-first century. Until the 1970s, catfish farmers sold their fish directly to restaurants, supermarket chains, and other outlets; local plants subsequently began stunning, beheading, gutting, filleting, and freezing the fish for sale through brokers. Production increased dramatically in the 1980s when automation replaced manual filleting of catfish. As the industry grew, cooperatives, most owned by a hundred or more catfish farmers, helped cut costs and increase profits. The industry has benefited owners as well as workers, especially in the Delta, which has a high poverty rate, and double-digit unemployment, and where jobs on catfish farms and processing plants are coveted even though pay is low and benefits are minimal. In 2010 some six hundred union members in Mississippi Delta catfish plants defeated a contract that would have erased gains they won in a 1990 strike. The new, agreed-upon contract offers hope for improved wages and benefits in the future. Catfish restaurants, most of them specializing in fried catfish, are common throughout Mississippi. Many of them proclaim that they serve Mississippi-raised catfish to differentiate their product from imported fish. Mississippians have long enjoyed local catfish at home as well as in restaurants, and in recent decades they have helped make it a favorite food across the country. “Even cerebral gourmands in restaurants on the Upper East Side of Manhattan and the Sunset Strip of Los Angeles have been extolling the piquant delicacies of Delta catfish,” Willie Morris observed in his 2000 book, My Mississippi.